A healthy mix and growing. 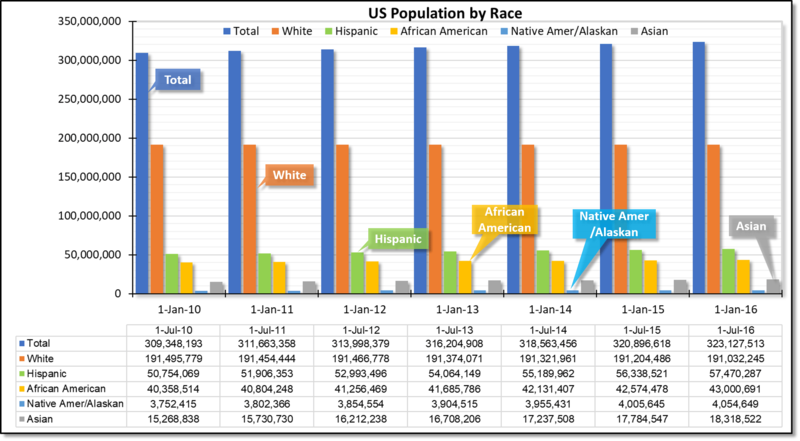 Annual population estimates for different ethnic groups by US census bureau, 2010-2016. The US census bureau makes annual estimates of population. Based on their latest estimate, the US population in 2016 was 323 million. About 60% of the population is white (191 million) and next biggest groups are Hispanic (57 mil, 18%), African American (43 mil, 13%) and Asian (18 mil, 5.5%). The smallest group is Native American and Alaskan at approximately 4 million (1.2%).